Test Requisition Form | Medical Diagnostic Laboratories, L.L.C. A test requisition form (General Test Requisition Form, OBGYN Test Requisition Form or Urology Test Requisition Form) must be submitted for each patient and completed based upon the instructions below. A test requisition form must be submitted for each patient. If multiple specimens are submitted on one patient which require separate transportation conditions, please use separate biohazard bags and forms. 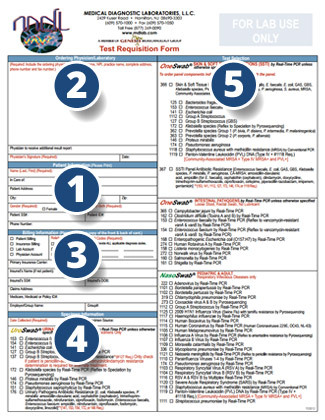 The following sample test requisition form has been numbered 1 to 5 as a reference for each of the 5 steps below. Please complete all of the following information in this section. Not only is it important for positive patient identification, but also for billing purposes. All ordering physicians must provide complete information, including the NPI # and/or UPIN #, the first time a specimen is submitted. Once that physician is added to our database, the physician’s name, office location and MDL Account # are sufficient. One billing option must be checked. If no information is provided, the patient will be billed directly. If submitting third party information, either complete all areas or simply attach a photocopy of the front and back of the patients insurance card. Be sure to include appropriate diagnosis codes when submitting specimens for third party billing patients. The date of collection is a very important, often overlooked piece of information. If the actual transport time exceeds the recommended time frame, then the integrity of the results may be compromised. It is also essential in determining the order of specimens in serial testing. Please identify the source of any specimen other than blood. This is particularly important for biopsies and body fluids. Don’t forget to indicate all tests being ordered on the Test Requisition!